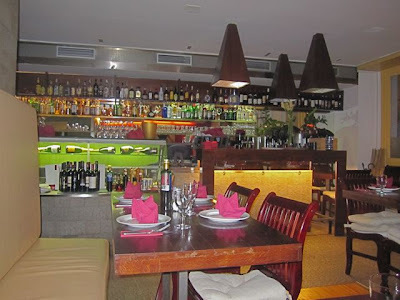 A very successful American businessman passed along the recommendation for Il Primo. 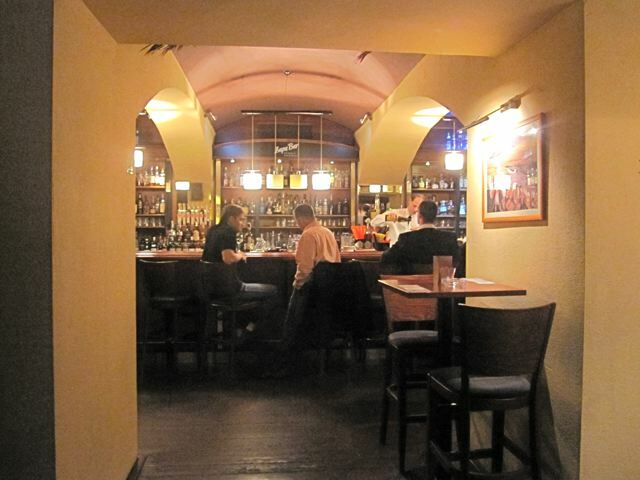 The long-time Prague resident told V that the Old Town Mediterranean restaurant was "simple, but good." So she suggested we give it a try on Saturday. It was fortunate I booked ahead. The small dining room has only eight tables or so, and we saw many people turned away over the course of the evening. From our spot, V enjoyed the view of the Spanish Synagogue across the street. To start things off, our very friendly and helpful waiter brought us a basket of decent bread. Unfortunately, he also removed our plates, so we had nowhere to pour olive oil for dipping. V and I felt like some wine. The house red was smooth, dry and pretty good for the price (80 CZK/glass). There were a few Italian and Spanish bottles on the wine list in the 400-500 crown range, but then prices went up quickly from there. 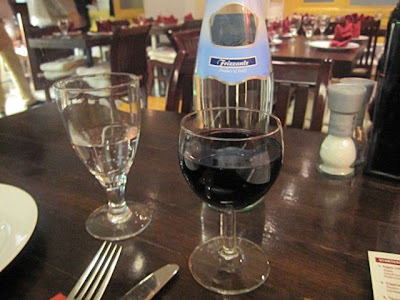 We also got a 1 liter bottle of sparkling San Benedetto mineral water (110 CZK). 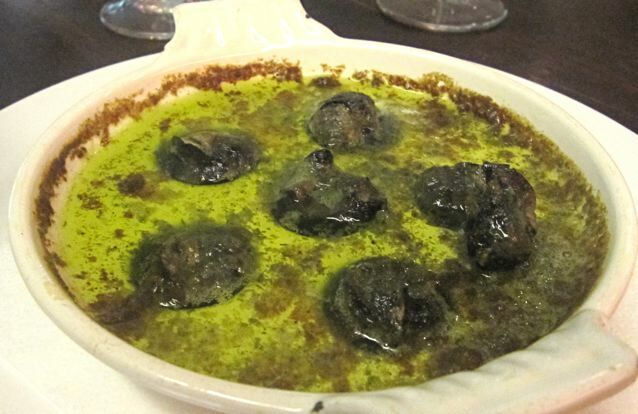 V began with the escargots à la bourguignonne (145 CZK). She enjoyed the six, plump, clean-tasting snails. On occasion, we've had escargots in the Czech Republic that tasted a little too much like a garden, but that was not the case here. 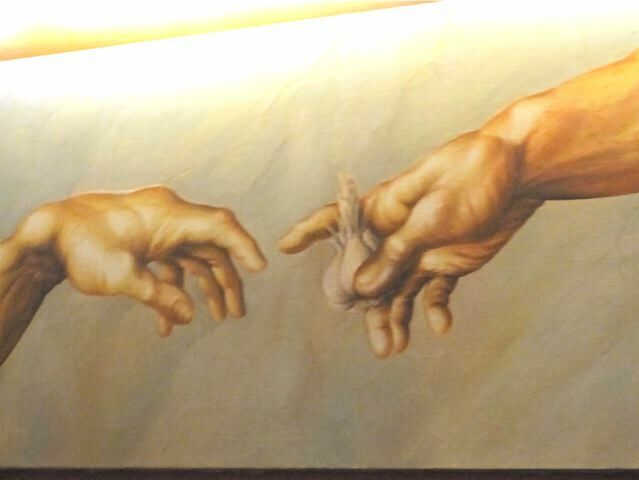 I only wished for a little more garlic flavor on these. 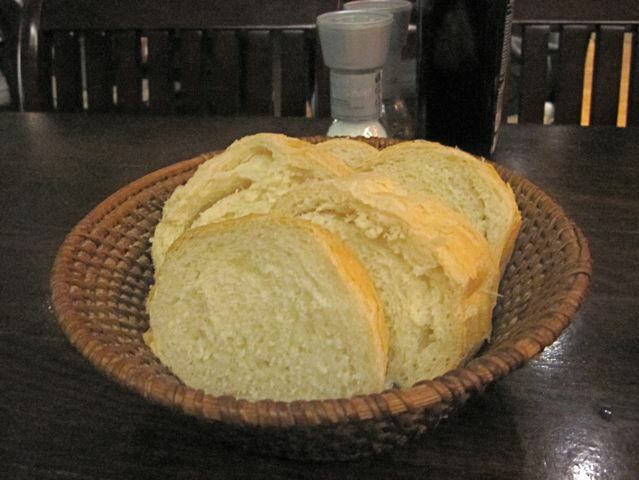 I still used the bread to soak up what remained of the butter and parsley after the snails were gone. I went for the grilled calamari (145 CZK). The flavor, with plenty of lemon and pesto, was excellent. However, the texture left much to be desired. They were overcooked and dried out. Flesh that should have been delicate and tender was bordering on tough. 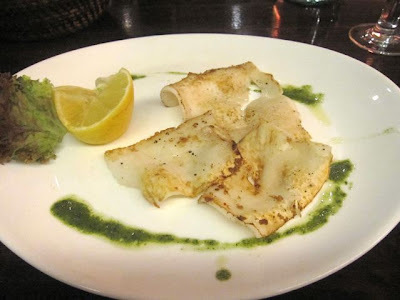 The larger but pricier grilled calamari at Luka Lu is much better. 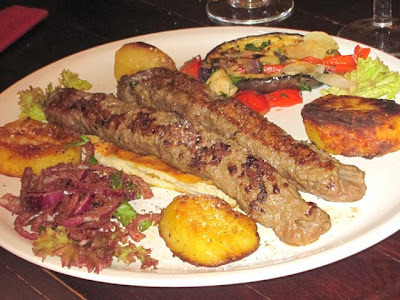 For a main course, V stuck to the simple side of the menu and ordered the Beirut Kofta (240 CZK). She received a very generous portion of the minced lamb and beef. She liked it very much. The overall flavor was quite good, but almost overwhelmed by cumin. In my opinion, it was too salty. The grilled eggplant, peppers, and potatoes were all excellent. V especially liked the raw red onions dusted with spices. I decided to get a special the waiter recommended -- T-bone steak served off the bone with Béarnaise sauce (440 CZK). It took considerable time for our mains to arrive, and as soon as my fork hit the hardened meat, I knew there was a problem. I had asked that it be cooked medium-rare. A slice of the knife confirmed it was cooked well-done all the way through. Fearing that I'd have a long wait for a replacement, I considered eating the tough steak. But V encouraged me to send it back. The waiter was very apologetic and promised a new plate would be out shortly. A fresh plate arrived back at the table in about 10 minutes. This one was cooked perfectly. And it tasted absolutely wonderful. 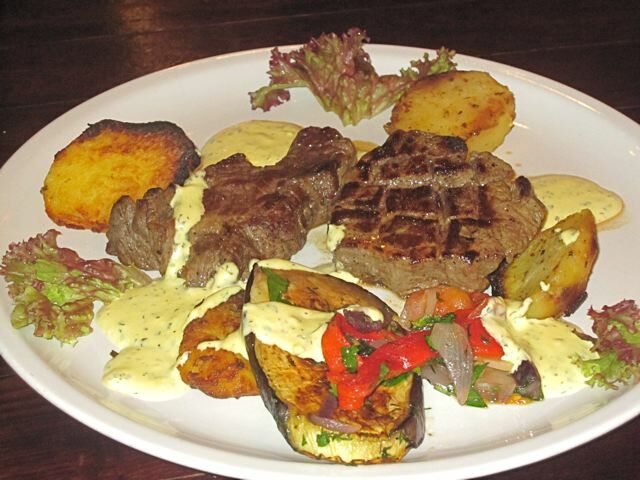 The steak was tender in a way that steaks in Prague rarely are. There was a perfect balance of salt, and it picked up some nice flavor from the grill. It also came with those nice grilled veggies. 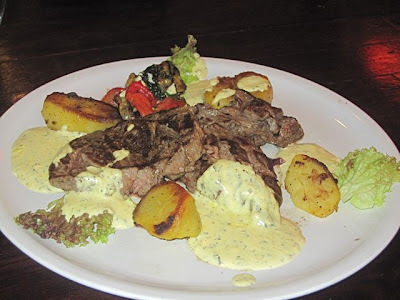 To top it all off, the Béarnaise sauce was eye-rollingly good. It was so rich and creamy, V compared it to a crème brûlée, but with a balanced tartness with taragon instead of sweetness. She was even dipping her kofta into the generous portion they put on my plate. I'd love to have this again and enjoyed it as much or more than my more expensive rib eye at La Finestra in Cucina. I was full, but needed a chocolate fix. 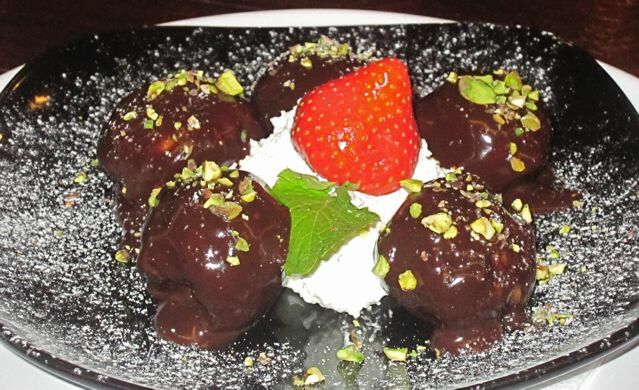 I ordered the profiteroles (130 CZK). The dark chocolate sauce was satisfying, but would have been better if it was heated. The small pastry balls filled with frozen cream were not bad, but had obviously been frozen for a while. We finished the meal with a couple of very average cafe lattes (60 CZK each). 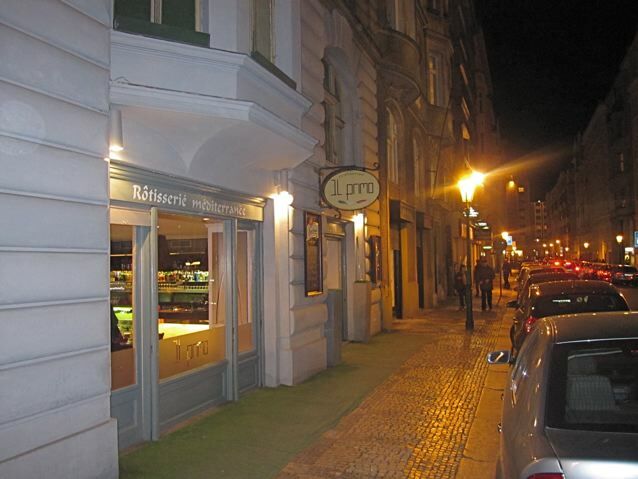 The meal came to 1710 CZK without gratuity. 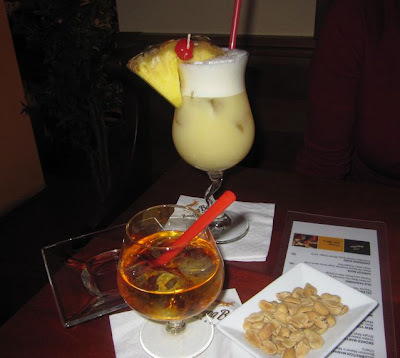 We felt like an after dinner drink, so we then walked about 100 meters over to Zapa Bar on Dušní. Consider this a small bonus tip in this post. The reason I go to Zapa Bar is because it's not a bad looking spot, but more importantly, it has no scene, as far as I can tell. Few people seem to know about it and not many seek it out. What that means is I can almost always find a table and then have an audible conversation and a drink, even on a Saturday night. So V had a pina colada (120 CZK). She liked it because it had very little cream and was more pineapple and coconut oriented. 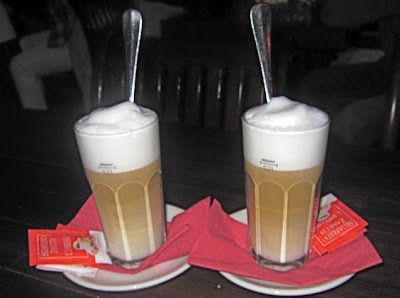 I had a Benedictine and Brandy (115 CZK). I was somewhat taken aback that it was served on the rocks. I've always had it straight up and never had to specify. I drank it with the ice, but I'll make sure they leave the ice out next time. 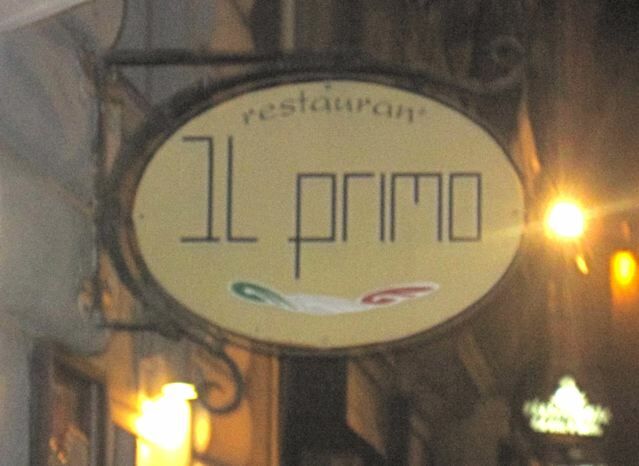 As we sat listening to Zapa Bar's DJ play "Riders on the Storm" we talked about our meal at Il Primo. Certainly, the restaurant did not succeed at a few things. But given a chance to try again on the steak, they provided one of the best and most memorable dishes I've had in a while. One great plate can really make or break a place sometimes. So we're not ready to quit yet on Il Primo. We both said we'd try it again if we were in the neighborhood. Maybe we'd go for some of their cheaper mezze if a table is available. I just hope it's more consistently good and the chef has a lighter hand on the stove. Otherwise, I'll feel like a damn fool. Oh, all these food is just for one person?